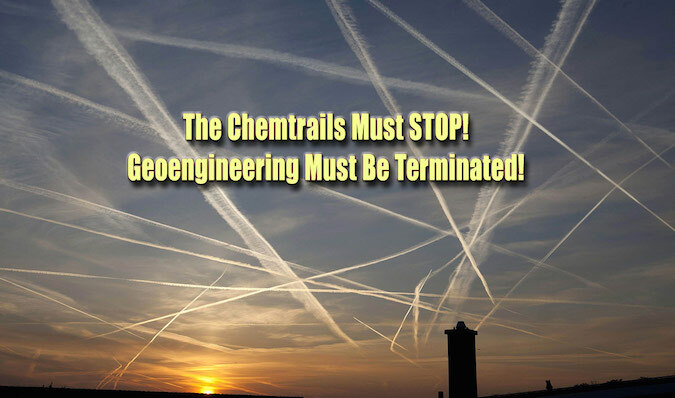 The current geoengineering regime, which blankets Planet Earth with chemtrails 24/7, constitutes the single greatest threat to humanity and the biosphere. The most insidious aspect of this planet-destroying endeavor is that it is happening almost completely under the radar, as well as above the clouds. By that it should be understood that the vast majority of 7 billion people who inhabit the planet are completely unaware of the covert global geoengineering program. When such is the case, and officialdom works triple time to deny the very existence of chemtrails by saying they’re contrails, those in the know must respond appropriately. Hence, the best way to draw attention to this “pink elephant in the living room” is to bring a lawsuit against the responsible parties in all the appropriate jurisdictions. Lawsuits always have a way of efficiently disseminating the details of such top secret black operations. Most people don’t like their tax dollars being spent on furtive programs that are so harmful to human health and destructive to the global environment that is already under grave assault. This lawsuit is still in the earliest planning stages. The exploratory phase is quite deliberate in order to ensure that every legal standard is properly met. It is very easy to jeopardize such a prodigious legal initiative, so every aspect must be carefully tended to and properly executed. The judicial branch throughout the entire USA has shown repeatedly where it stands vis-å-via We, the People and the U.S. Federal Government. 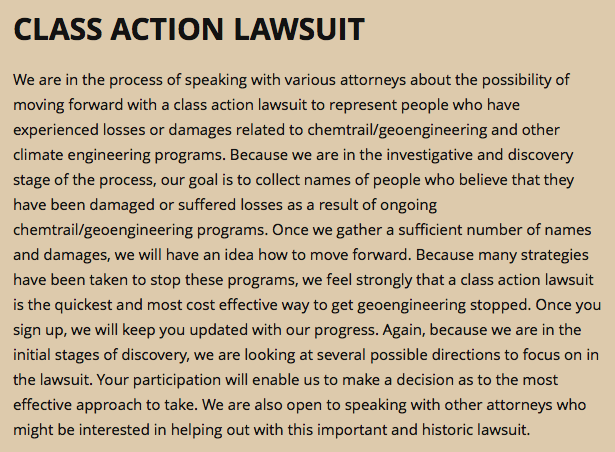 The following screenshot from GeoengineeringActionNetwork.org explains some of the background and purpose of the upcoming class action lawsuit. For those who have suffered business loss from the chemical contamination that occurs each time the toxic chemtrail aerosols fall to the earth, please consult the following list of general types of damages which are routinely experienced. If you or your loved ones have ever experienced a persistent combination of the following symptoms, you may be suffering from Chemtrail syndrome. The following link provides a thorough explanation of this syndrome which is fast becoming a pandemic. Only when a critical mass of people around the globe wake up to the reality of geoegnieering programs — being conducted right above their heads — will the governments of the world be forced to terminate them. One way to make this happen sooner than later is to spread the word about the extremely harmful effects of chemtrails. Injury to both human and animals from chemtrail exposure is now pervasive, as is the profound damage to all trees and vegetation. The list above ought to give every person good reason to join the upcoming lawsuit. There is no such thing as organic food anymore because of the chemicals which rain on all farmland from the chemclouds above. Likewise, every water supply has been contaminated with the same noxious chemicals. The same water is then used to drink, cook and bathe with as well as water crops. There is simply no escaping the detrimental health effects of chemtrails, no matter where you live. The other exceedingly adverse consequence of chemtrail-laden skies is the incessant sun blockage. Not only is vitamin D synthesized by the skin upon exposure to the sun, the human body relies on sunlight to carry on a number of bodily processes. The eyes are especially nourished by a regular dose of sunrays. So is the spine when it is exposed to 10 minutes of direct sunlight once a day or whenever possible. Therefore, anyone who doesn’t like the sunny skies being constantly transformed into cloudy and overcast ones ought to stand up to the oppressive geoengineering regime in place across the planet. For those who are new to chemtrails and their ubiquitous and deleterious effects, the following two articles explains the basics. By joining this lawsuit, what’s in it for you, your family and your community? 3) A sense of satisfaction that you did the right thing for future generations, as well as for the viability of the biosphere.